Stuck at home because of weather or in the office because of work? Scratch your fishing itch with the best topwater bites for bass and pike. Whether I'm fishing for bass, redfish or something up north with teeth, it's difficult for me to pick out one bait and bite that I enjoy more than others. Jigs? Love them all whether it's swimming them near vegetation or submerged cover, flipping around docks or brush or dragging them on a shell bed on hard bottom. I loathe slow presentations. Swimming a white or black jig with matching trailer gets my motor running pretty strongly. I've caught redfish in Louisiana on a crab-colored jig and swimming presentation, too. Great fun with powerful fish. It's tough to beat a spinnerbait or crankbait bite, of course. Both offer some auditory and visual attraction. Both can be fished high or low in the water column, around cover, on structure and for multiple species. They're great in small or large sizes, too, fished fast or slow. But if I had to pick, if someone said, "choose one," it probably would be some kind of topwater bait. I have multiple Plano boxes of Lucky Craft Sammy, Heddon Spook and Pop-R hardbaits, soft swimmers like the Stanley Ribbit, large and small buzzbaits, hollow body frogs, old baits like the Crazy Crawler and relatively new ones like the River2Sea Whopper Plopper. They all get put to use in different situations. The latter is, at the moment, my go-to topwater. Give me a Whopper Plopper 110 or 130, some Vicious braided line and I'm a happy camper. When a bass strikes, it's electrifying. My first trip up north more than 20 years ago for northerns (I call 'em pike) was fantastic. I caught them on big 3/4-ounce Rooster Tail inline spinners and topwaters. I thought about that trip when I ran across this video of an awesome bite from Fishing With JD. Wait for it. It's pretty great. Most of my fishing is for largemouth and smallmouth, with spots targeted occasionally. I like catching all of them, but mostly enjoy trying to figure them out. Every time is a learning experience, or should be, to pick up another bit of knowledge. One of the coolest topwater bites came a few years ago in summer when I was wading a small river near our home. It's clear and cool, even in summer. While throwing a downsized topwater frog near a log, I could see a fish ease out from under the log. I let the bait just sit and the bass swam around to face it, eased up and then slammed it. Yikes, what a rush. I love it. 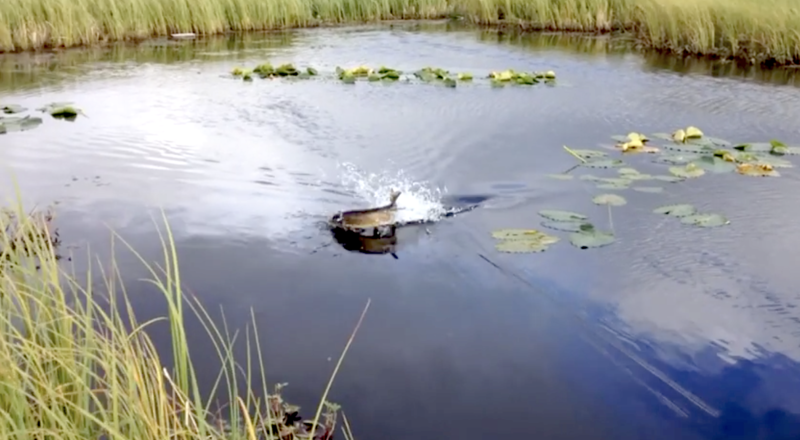 Check out these 10 bass strikes on topwaters in this cool video shot by Stephen and Liz Russell with BamaFrogs.com. They have some awesome strikes on camera along with some great baits.